– there are very few ice-free lakes to date in any of the mountain parks, lakes that are currently ice-free include Vermilion Lakes in Banff and Horseshoe Lake in Jasper. – Waterton Lakes National Park is still largely snow and ice-bound, but bears and other wildlife are out and about anyways. 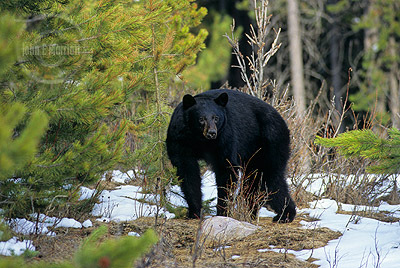 – bears are out in Banff, Jasper, Yoho, and Kootenay, but no young cubs have been sighted yet in any of the parks. – green grass is beginning to appear at lower elevation in all of the parks, with a few leaves beginning to bud in Jasper and the southern part of Kootenay National Park.